According to the US Department of Energy, 70% of total energy loss in a pool (both indoor and outdoor) is due to evaporation http://energy.gov/energysaver/articles/swimming-pool-covers Evaporating water requires a tremendous amount of energy. It only takes 1 BTU (British Thermal Unit) to raise lib of water 1°F, but each pound of 80°F water that evaporates takes a whopping 1,048 BTU of heat out of the pool. * (1 gallon= 8.33 pounds). Therefore, for every gallon of 80°F pool water that is lost due to evaporation we lose 8,729 BTU of energy. Pool Blankets can offer significant energy savings and drastically reduce water and chemical consumption as well as cleaning time by keeping dirt and other debris out of the pool or spa. They often pay for themselves in a few years when properly and consistently used. 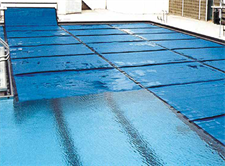 Unlike a physical solar cover to protect the pool water from heat loss and evaporation that works well when the cover is actually in place at the surface of the pool. A liquid solar cover works all the time. 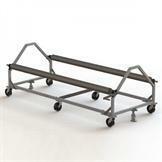 Pro-Series Liquid Cover is a liquid solar product that significantly reduces heat loss and evaporation. These are great for pools that are open long periods of time, odd shapes and sizes, and pools lacking in maintance people to apply physical covers. Liquid covers can be automated to make additions easier. We have different models to suit your needs. 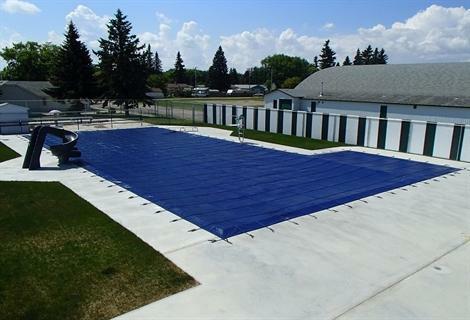 Commercial pool blankets last longer when they properly cared for. These covers have somewhat of a trampoline appearance, with spring-loaded straps connected to the cover, and anchored into the concrete, to hold it in place. These custom made covers are made of a mesh material that is very effective in keeping leaves and debris out. They can also support a great amount of weight, including heavy snow loads and also reduce the amount of sunlight into your water helping prevent algae growth in the spring. Because it is mesh the rain water and snow melt just passes through, and so once it is on for the off-season, there is typically no additional upkeep to worry about. These covers are custom made for you pool. We can cover almost any size or shape of pool. Ask us about mesuring your pool for one of these covers.